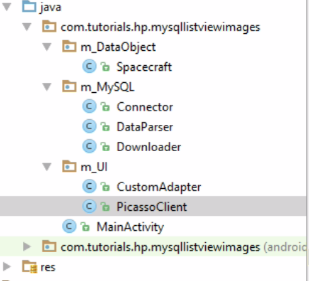 Android MySQL images text listview Tutorial. We see how to select images and text from mysql databse and show in a ListView. 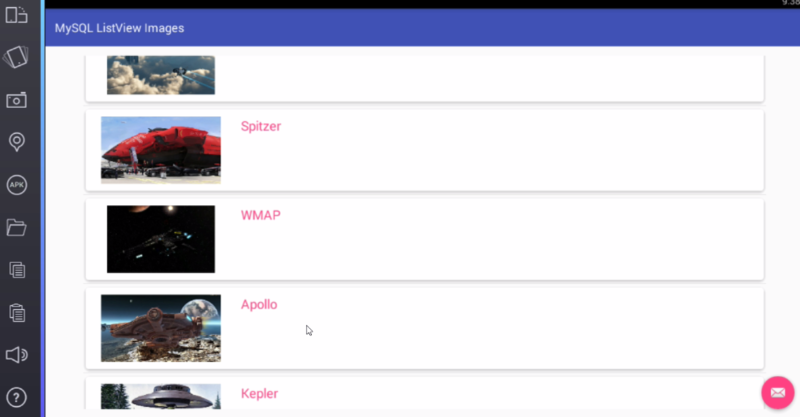 Applications are many that show lists of data in google play.Most of the time these images aren’t stored locally.That would be a disaster in terms of the amount of storage these applications utilize as well as the overall performance of the application. These images usually have to be in some ways dynamic.Image manipulations when done locally can be quite resource intensive,hence the resizing and manipulations can be done in the server side.Anyway today we want to see how to retrieve images from a MySQL database and show them in our ListView. We only retrieve the image urls from the database and render the images using Picasso.This ensures we can lazily load the images and can even resize them without any considerable performance penalty.We show text alongside the images. Fetch images urls and text from MySQL database. We make a HTTP GET Request hence receiving a blob of json data. This data,the json array,we parse it using JSONArray and JSONObject classes in our java android. We render the images using Picasso ImageLoader library. The ListView consists of images and text. We are using AsyncTask to perform this GET request. This ensures our Main Thread remains responsive. To show user progress we use ProgressDialog. Both parsing and downloading data,we abstract them in separate classes. We also do both in background thread. Images and Text MySQL database. Custom ListView with Images and Text. PHP MySQL android select data. Picasso Imageloader to load images to ListView. Add a dependency statement for a Picasso library we’ll use. Below is our PHP script we used in this tutorial.You need to use your own database credentials. The script selects data from mysql database. It then encodes it into JSON format. When we make a GET request we end up with the JSON array. We chose Basic activity so two layouts are auto created by android studio.ActivityMain.xml and ContentMain.xml. We then go ahead and create Model.xml. Lets add our ListView here. This shall get inflated to a single view item in our ListView. In this part we are going to write some java code.We prefer to break down our work into one class one responsibility so we may use many classes. We are using Picasso library to load our images,so we need its dependency. We are using CardViews within our custom ListView. Add Internet permission cause we are downloading the images via their urls from our mysql database via php code. Represents a singe data object. Responsible for connection to network. Downloads data in the background thread via asynctask. The data is then parsed to Data parser class to be parsed. Parses our downloaded json data natively. Then passes this data to CustomAdapter to be bound. Uses Picasso ImageLoader to download our image into an imageview. Binds our data into our adapterview. Executes our Downloader Asynctask class to start downloading on floating action button click.